It's been quite some time since the last release by Mike Soucy on Earth Mantra. But the wait has been very much worth it. 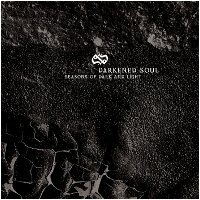 Mike's latest chapter in the Darkened Soul series, entitled Seasons of Dark and Light, is a gorgeous and deep collection of moderately dark ambient music. And by deep, we mean all the way to the abyssal depths. What a collection of music this is. Certainly the music retains Darkened Soul's trademark dark flavor, but there is so much more to this music than just obscure and scarey soundscapes. The album is composed of four pieces, each representing a different season of the year. The thing that blows us away is how well Mike nailed the feel and mood of each one, perfectly matched to the theme of the season it evokes. Winter's Cold Stare is of course dark and ominous, with great solitude and distance, like slowly gliding icebergs floating in a dark and frigid sea. But then The Advent of Spring arrives, with lush rain storms, birds chirping, and a powerful, almost symphonic motif. One can almost see the dew dripping from the leaves of the freshly bloomed flowers. Next is Sublime Summer, a snapshot of a hot and sultry summer's eve, complete with singing insects and distant thunder. The listener can feel the heat rising up off the concrete and see the stars twinkling in the humid air. Then the album is closed out with An Ominous Fall, a foreboding and yet lovely drone that heralds the beginning of yet another annual cycle. We've long been fans of the music of Darkened Soul, but we're particularly excited about Mike's latest work. Some of the most mature and well thought out dark ambient we've heard, combined with some truly lovely melodic ambient music. Truly something for everyone to enjoy. So it is with great pleasure we unveil to our listeners Seasons of Dark and Light by Mike Soucy of Darkened Soul. May it be only the second in many future Earth Mantra releases by this gifted artist. "The Advent Of Spring" is truly a sonic masterpiece.